Kick4Life FC is unique. No other football club exists in the world that is dedicated purely to bringing about real social change in its local community. 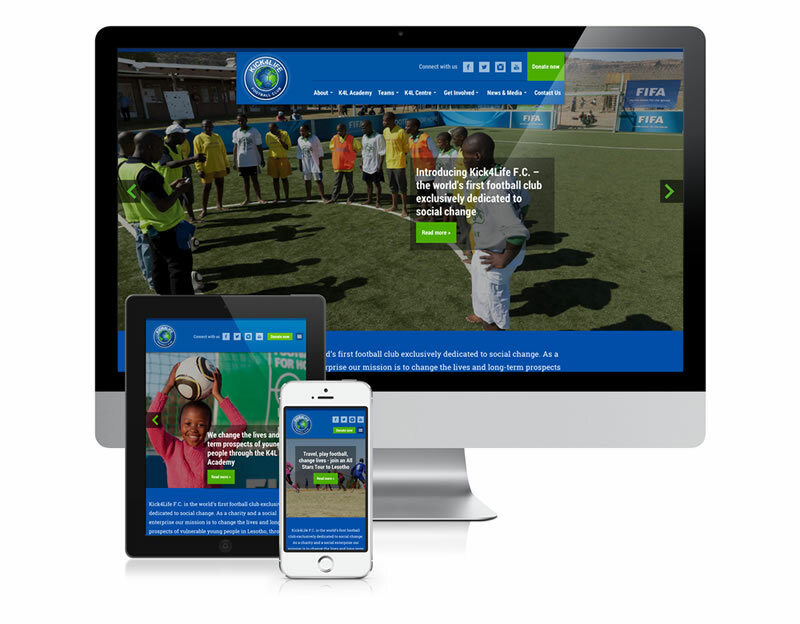 At bandv we are pleased – and very proud – to have been able to support Kick4Life through the development of their brand new website, Kick4Life.org, which has just launched in time for the new football season in Lesotho. 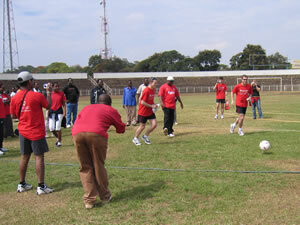 Kick4Life was the brainchild of Steve and Pete Fleming who, in 2005, dribbled a football 250 miles across Malawi, raising funds for an orphanage. Their experience inspired them to found Kick4Life, a charity which would use football as a catalyst for bringing about social change in Lesotho – a beautiful country with a rich history and culture. It also has the world's second highest prevalence of HIV (23.2%) and more than 160,000 children have been orphaned. 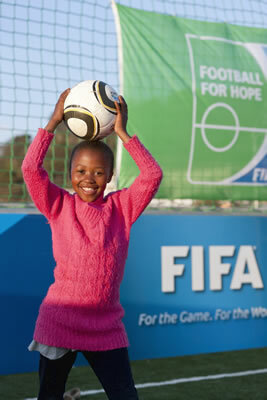 Since its launch in 2006, Kick4Life has gone from strength to strength, securing major funding from various foundations which has been used to build the Kick4Life Centre in Maseru, the capital of Lesotho. Facilities include football pitches (both grass and artificial), medical and counseling rooms, classrooms and a children's playground. There is also a restaurant, No7, a hotel and conference centre, a produce garden (supplying the restaurant with fresh fruit and vegetables) and a media suite and library. All of which are run as a social enterprise which trains young people, giving them skills with which they can find employment and so improve their life chances. In the past few years, two members of the bandv team had taken part in football tours organised with Kick4Life and the Saints Foundation, on which they saw for themselves the great work that Kick4Life undertake. As part of our support for Kick4Life, bandv have also just funded a place for one lucky winner of our prize draw on the next football tour, taking place this November. Kick4Life have big plans for the future. Now Kick4Life FC, their men's team current play in Lesotho's Premier League and the whole enterprise continues to grow. They approached bandv with a view to developing a new site for Kick4Life FC which would have to perform a number of different functions: to act as a fanclub site with all of the usual features that might be expected, but also to promote the charity and enable fundraising, as well as providing information about the restaurant and the hotel and conference centre which are social enterprises under the Kick4Life umbrella. two hospitality businesses which Kick4Life wanted to be held within the main site (to reinforce their status as part of the umbrella charity), but to have separate identities with a different visual style from Kick4Life FC. And of course, the site also needs to make it easy for people to make a donation and get further involved in supporting Kick4Life in their work. After several meetings and some refinement, a plan was formulated and the site structure was nailed down. Then the design concept work could begin in earnest. We were blessed by the fact that one of K4L's funders had been FIFA and, as part of their promotional work, they had taken a lot of professional photographs and had made them available to K4L. So often imagery is a major sticking point with developing new websites - I can't emphasise enough how 'grabbing an image from another site' is never the answer! So we were lucky enough to have a good selection of high quality, high resolution images which set the scene beautifully on each page. Another factor that so often leads to major difficulties is poor (or even a complete lack of) content for the site. Having worked hard with K4L at planning stage, there was a clear understanding of exactly what content was required and K4L busied themselves with ensuring that they pulled that content together while bandv laid out the page designs ready to accommodate it. Despite the site's complexity, the time invested in the groundwork paid dividends and the site design came together quite rapidly. K4L were consulted at every stage but, having identified and set goals early on in the dialogue, there were minimal changes to be made and we were able to progress to programming with very little delay. After the 'pretty' bits it's time for the developers to work their magic! It had been established early on that, with so much information that required frequent updates, the site had to be built on a platform that provides a clear, easy-to-use content management system. This allows K4L to handle the everyday updates with minimal support (although bandv are, of course, always on hand when support is needed!). News and updates, as well as images, videos and pretty well any other site content, are all accessible and easily updated via a simple online login area – particularly useful to Kick4Life, whose administration is split between Lesotho, the UK and the United States! We have also ensured that the site is fully responsive so that it can be viewed across all platforms and devices with no loss of content or functionality. This has become pretty much standard practice now for bandv on more recent website developments, but the complexity and scale of the Kick4Life site, with its varying page types and templates, presented quite a challenge – tackled and met by our developers with great aplomb. In addition there were a number of areas of the site where K4L wanted to enhance viewer engagement, so we implemented some clever HTML5 animation to help bring those areas to life and hold the viewer's interest. So now the site is live – take a look for yourself at www.kick4life.org where you can find out more about the charity and see all the great features the site has to offer. And while you're there why not make a donation or, even better, join the fan club – every penny raised will be used to help make a real difference to the lives of children in Lesotho. And if you're considering a new website that can work much harder for your organisation, why not contact us and let's discuss the possibilities. We can help you to plan and implement a site that not only looks great, but can be a real asset to your business.